IVY Studio, LLC based in Massachusetts provides aquatic consulting services including planning, designing and managing of residential outdoor pool and spa projects. A busy time for us begins in the fall season, when the summer season draws to a close. Traditionally summer/fall heralds the ideal time to start being proactive around your yard as you plan your next season’s project in expanding your outdoor environment. Summer is punctuated with the onset of days getting shorter and evenings arriving earlier and average temperature falling. Being proactive in during this period allows our clients contemplating expanding their outdoor environment with the addition of a pool and spa to work with us in developing and refining their aquatic masterpiece and have all the pieces in place and ready for implementation the following spring. Meeting over the fall to winter period with our design professionals, the planning and designing phases get completed and the specificity of detailed material choices needed for the implementation phase are figured out. Also, all the budget and selecting the sub-contractor artisans needed for the project are aligned and ready before the earth is disturbed. Construction documents are reviewed and we facilitate meetings with client, design professionals, artisans and suppliers. All the requisite permitting is in place and ready to go and as soon the ground thaws, we are marshalled and ready to commence with the project. 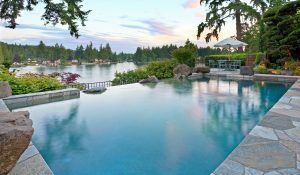 Our projects not only include aquatic feature like pools and spas, but usually also incorporate outdoor kitchens, landscaping, irrigation, lighting, fencing, pool house structures and the like. All of these components need a set of plans, so the entire process is detailed and defined. Come the following spring, lights, action and sound are in concert with plans, site and equipment, with professional management underway by IVY Studio. To learn more about our process contact us at 781-591-0300 or vern@ivystudioMA.com and learn why we are redefining traditional pool and spa building methodology.